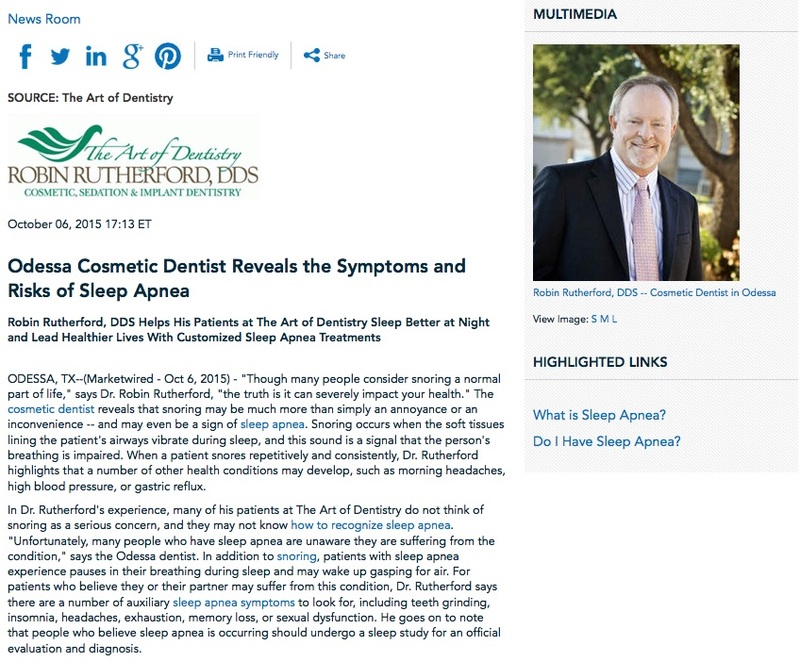 Robin Rutherford, DDS helps his patients at The Art of Dentistry sleep better at night and lead healthier lives with customized sleep apnea treatments. Odessa, TX – “Though many people consider snoring a normal part of life,” says Dr. Robin Rutherford, “the truth is it can severely impact your health.” The cosmetic dentist reveals that snoring may be much more than simply an annoyance or an inconvenience – and may even be a sign of sleep apnea. Snoring occurs when the soft tissues lining the patient’s airways vibrate during sleep, and this sound is a signal that the person’s breathing is impaired. When a patient snores repetitively and consistently, Dr. Rutherford highlights that a number of other health conditions may develop, such as morning headaches, high blood pressure, or gastric reflux. In Dr. Rutherford’s experience, many of his patients at The Art of Dentistry do not think of snoring as a serious concern, and they may not know how to recognize sleep apnea. “Unfortunately, many people who have sleep apnea are unaware they are suffering from the condition,” says the Odessa dentist. In addition to snoring, patients with sleep apnea experience pauses in their breathing during sleep and may wake up gasping for air. For patients who believe they or their partner may suffer from this condition, Dr. Rutherford says there are a number of auxiliary sleep apnea symptoms to look for, including teeth grinding, insomnia, headaches, exhaustion, memory loss, or sexual dysfunction. He goes on to note that people who believe sleep apnea is occurring should undergo a sleep study for an official evaluation and diagnosis. “When left untreated, sleep apnea may lead to more serious medical concerns, such as diabetes, depression, a compromised immune system, stroke, or heart disease,” says Dr. Rutherford. To help treat sleep apnea and restore his patients’ ability to sleep well at night, Dr. Rutherford’s cosmetic dentistry practice offers a number of solutions including customized oral appliances or, in more serious cases, oral surgery. These treatments can improve airflow, prevent the onset of more complicated and life threatening medical conditions, and improve the patient’s overall quality of life. Named the “Best Dentist in Odessa” by Odessa American, Dr. Rutherford has also been recognized for his excellence in dentistry by Texas Monthly magazine and named one of the “Texas Super Dentists” several years in a row. He earned his dental degree from the University of Texas Dental School at San Antonio and is an active member of several medical organizations, including the American Academy of Cosmetic Dentistry and the American Orthodontic Society. In addition, Dr. Rutherford is a Diplomate of the American Dental Implant Association and a Fellow of the Dental Organization for Conscious Sedation. He is available for interview upon request.